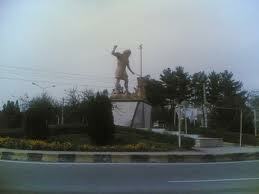 Main roundabout, Kaveh Industrial City, near Saveh. Since the beginning of the current Iranian year, and in the aftermath of the recent months’ dramatic rise in prices, many factories across the country have either closed down, or, by decreasing the production volume and reducing or “adjusting” the labor force, are going through severe hardships. As a result, thousands of workers have lost their jobs with the closure of factories or, if still working, are working under insecure work conditions, face delays in payment of their wages, and are at risk of being laid off. In many factories, the number of work shifts and work hours has been radically reduced, and only this has generally made the life of an Iranian worker much more difficult: across the country, workers’ livelihoods have become increasingly dependant on income from overtime labor. As factories scale back production, millions of workers only receive the minimum wage, 380000 Toman. With today’s costs of living, this has forced millions of workers and their families into a horrific situation. Today, on the one hand, the factories are in crisis, and millions of working class families are facing severe reductions in their providers’ incomes; on the other hand, the rise in prices and inflation are not about to stop, and the cost of living increases every day. In relation to the foregoing, the following short report presents the situation of the KavehIndustrialCity. The situation of these factories, more than any study or analysis, describes the miserable circumstances of millions of workers across the country. 1- Khavar Suspensions Company, a factory located on 7th Avenue, works with only one 8-hour shift at the moment. This factory, which produces springs for vehicles’ suspensions, had previously employed three 8-hour work shifts. 2- Iran Saveh Company, located on 7th Avenue, produces electrical cables. It has not paid workers’ wages for the past 3 months. 3- Paak-vash Company has closed down its print shop on 13th Avenue and has laid off 110 of its workers since the spring. 4- Bonro Saaveh, manufacturer of Fiat and Mercedes Benz, has totally closed down. 300 workers from this factory have been laid off. Iran Saipa has purchased the factory and at the moment delivers painting services to Pride vehicle parts. Saipa has transferred its surplus work force from Tehran to Saveh. 5- Production lines of Raniran, with 250 workers, have totally shut down. At the moment, only “after purchase” services are available. Raniran produces Volvo busses. 6- Behineh Teknik Company, which produces Pride car parts, has laid off 300 of its workers since the spring. 7- Emad-Daroo Company, which employs 110 workers, has not paid wages in the past 4 months. Twenty workers have been laid off. 8- Sun Ich Fruit Juice Company, with 60 workers, has closed down. 9- The following companies are semi-active: Saaveh Tiles, Bloor Glass, Float Crystal, Kaveh Sillis, Artoor Sana´t, Alum Pars and Electrolux. 10- The following companies are reducing their work force: Hepco, Azar-aab, and Pars Locomotive in Arak.